The contrast in colours from the 3 delicate red stigmas cloaked by purple petals on an Abruzzo Autumn day couldn’t be stronger; the saffron crocuses of Navelli are worth their weight in gold, and knowing that no Risotto Milanese is complete without it, they provide a never-ending market that is not reliant on fad or fashion. Navelli’s Saffron Queen is Gina Sarra, head of the Saffron Co-Op of AltoPiano Navelli comprising 80 small-holders who grow this most prized spice. If there was anyone who should blog it should be her, with her captivating tales and wonderful recipes, it would be a joy to read! I met her for a fortifying breakfast of Nocino, a green walnut liqueur, delicious (and how often can you say that about some of Italy’s regional liqueurs ) especially with chocolate cake, before I went saffron picking at what seemed the crack of dawn on a November Saturday morning…well, 7.30 am. Saffron was originally smuggled via Toledo in Spain across to Navelli by a mythological Dominican monk purportedly from the Santucci family in the mid C13th; the family Villa remains but no written records of him are in existence. 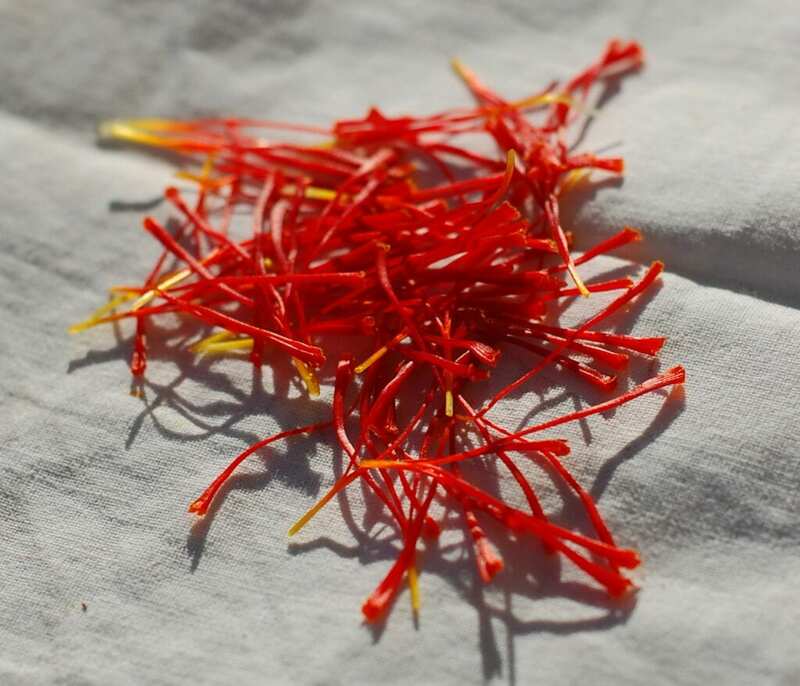 At that time saffron was regarded more for its medicinal, digestive, and antiseptic powers rather than it subtle taste, a taste that no-one seems quite capable of defining with one word. “Bling” is not really a term ever tied to the Renaissance, but during this period key families like the Medici began using saffron to colour their food gold, as a very simple display of their wealth at banquets… and so began saffron’s simple inclusion into European haute cuisine. As demand across Europe grew so did Navelli and the surrounding L’Aquila villages production of this red gold, making a pretty little town that sits about 30 minutes outside of L’Aquila (formerly famous for its chickpeas) become one of the most widely known in Abruzzo and one of its richest. The saffron grown here has been awarded an EU DOP status, as well as winning the international saffron ‘Golden Atom’ award. What Navelli supplies the crocus is a thick, sticky, mineral-rich black soil which the saffron flowers greedily lap up, so much so that saffron can’t be grown on the same plot of land for another 10 years. Bulbs are planted at the end of August, after they have been picked, cleaned & divided (after they have reproduced, which is what the bulbs spend their time doing the other 10 months of the year). If you go picking wear old trainers, as this dew-laden mud sticks and takes a bit more than a Flamenco stamp to get it off; stamp and slide your feet this way and that in the hope that it will re-attach itself to the grass. Wild boar adore saffron bulbs so each small area in which they grow is always tightly fenced and carefully padlocked to stop any unwanted devouring and naturally possible theft… as said it’s an expensive spice! It’s so worth making the effort to go saffron picking in Abruzzo at the end of October/beginning of Nov (harvest lasts just 15-20 days). The light at this time of the year is lower, softer, more work inductive than that of the hot summer, and with forget-me-not skies, snow-sprinkled Majella Mountains sparkling in the distance and temperatures a balmy average of 18C, flower-picking can be wonderful. Wild boar adore saffron bulbs so each small area in which they grow is always tightly fenced and carefully padlocked to stop any unwanted devouring and naturally possible theft… as said it’s an expensive spice! It’s so worth making the effort to go saffron picking in Abruzzo at the end of October/beginning of Nov (harvest lasts just 15-20 days). The light at this time of the year is lower, softer, more work inductive than that of the hot summer, and with forget-me-not skies, snow-sprinkled Majella Mountains sparkling in the distance and temperatures a balmy average of 18C, flower-picking can be wonderful. 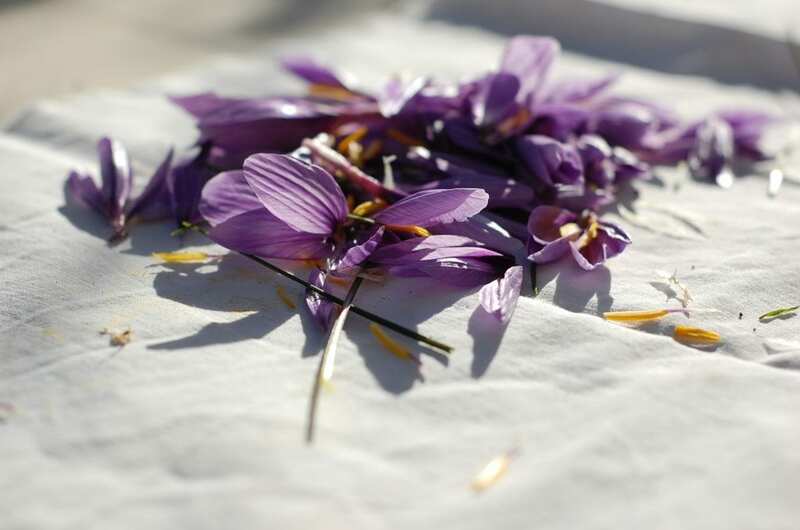 Early morning harvesting is required as quite literally the saffron flowers pop up overnight and need to be picked at first light before they begin to open their 6 petals. The reason for this is that it makes their later dissection, in which the precious future saffron threads are flicked and picked out by removing the white precious ovary that connects the 3 stigmas, so much speedier. The yellow stigmas are removed but for medical purposes rather than gastronomical, apart from countries like Iran where they incorporate them into their cooking for colouring in the same way as turmeric. The old ladies of Navelli come to help in this process, sitting at tables lined with a white cloth, chatting away. The next stage is when the saffron threads are toasted; placed into an upside down flour sieve over hot walnut or almond coals. 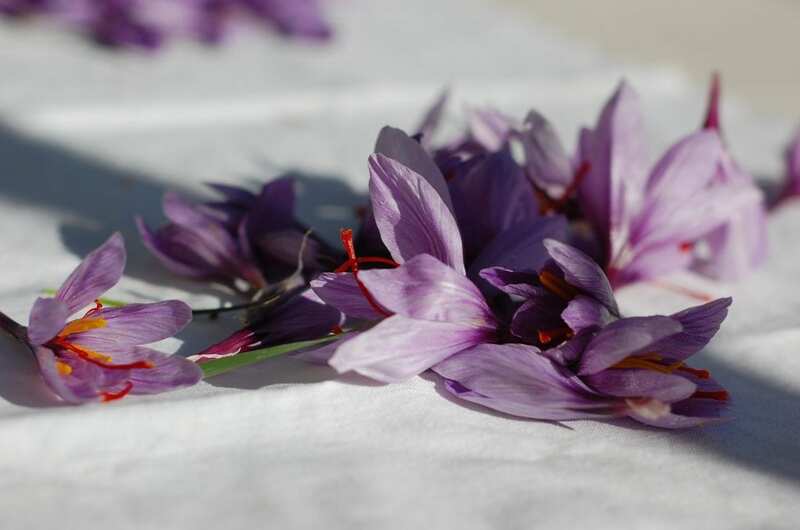 They lose 5/6 of their weight at this point so 600 g of fresh saffron yields just 100 g of dried ones which means that 200,000 flowers, 500 hours of labour produce 1 kg of saffron – this is the explanation of just why it is the world’s most expensive spice! The remaining petals are returned to the land as mulch, to help re-fertilise the soil for the crops that will take the saffron’s place. 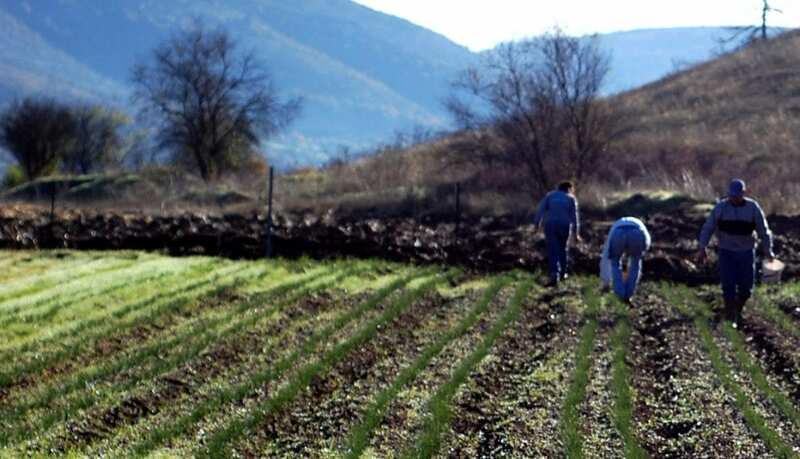 If you want to buy Navelli saffron, you can visit the cooperative that is housed in the Casa Verde (Green House that is also an agriturismo) in Alto piano Navelli, and where Gina Sarra, the Saffron Queen lives. Look for signs around Navelli to AltoPiano Navelli or Coop Alto piano Navelli – don’t make the mistake of going into the centre of Navelli if you are on a saffron mission as you won’t find anything! If you want to go on a Saffron Tour or have an experience picking Saffron and would like to stay overnight in Navelli for that early morning harvest, have a chat to Francesca who runs Abruzzo Segreto B&B in the heart of Navelli. RAI 3 recently stayed and made a programme about Navelli and the saffron which you can view here. Depending on the weather the saffron harvest is the last 2 weeks of October and first week of November. Gina Sarra sadly died December 28 December 2018. 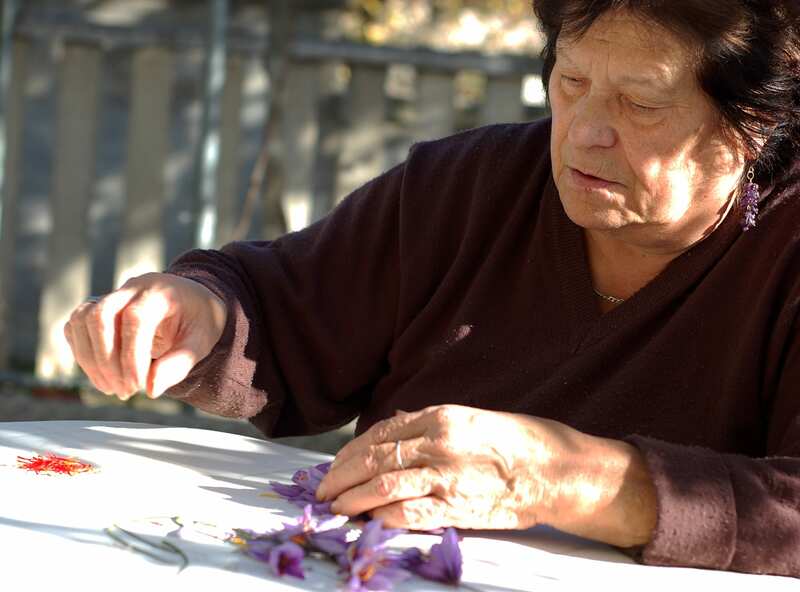 Passionate, determined she helped make Navelli saffron into what it is today, a spice sought after by the best chefs and tourists who want to take home something wonderful from Abruzzo. RIP Gina it was a joy to have met you. Wonderful memories of Navel–not too far from John’s father’s hometown! Thx Caroline, where’s John’s ancestral town?